Recommendation: An engaging tour of the culture and personalities of 19th Century Detroit. Definitely worth buying. The book is 152 pages long, plus a bibliography, and is broken up into 13 chapters by topic. Numerous black and white photos accompany the text. 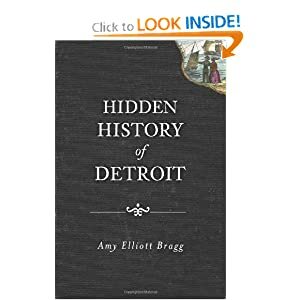 Bragg wrote this book based on her personal interest in the history of Detroit, and it shows. Much of the time she focuses on the people who made the city what it is, like Lewis Cass, Augustus Woodward, and Mythic Detroit's patron saint Hazen Pingree. The rest of the time she provides a window into people's experience of day to day life in the city. In both cases, you can sense that she thinks of these people as friends and neighbors, which makes reading the book feel a bit like reading a community newsletter or family Christmas card. Throughout the book she quotes extensively from people writing at the time, and many chapters are preceded by brief letters, newspaper excerpts and the like dealing with things like one candidate's plans for election day in 1796, or humorous elegies written by local court staff on the death of court crier Isaac Day. Her personal connection with the people and events she writes about makes her subjects come alive, and by alternating between specific events and the full sweep of a century she gives the story of the city both breadth and depth. This book sets a high standard for Mythic Detroit literature. While it doesn't tend to focus on the same subjects that we do here, it is a lot of fun to read, and brings into focus how dynamic the city was long before it earned the name of the Motor City.